Pharmacy Technicians work under the supervision of a registered pharmacy in a clean, organized environment to receive, dispense, and distribute medications and other health related products. They work in community pharmacies, long-term care facilities, in-home health care settings, hospitals, mail-order pharmacies and other medical institutions. 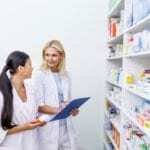 Technicians perform many of the duties once reserved for pharmacists. These include receiving information to fill prescriptions, accepting payments and processing insurance claims, packaging and labeling prescriptions, compounding and mixing medications, maintaining inventory and patient profiles, and mastering new technology. 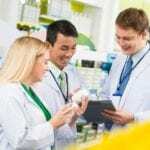 According to the United State Bureau of Labor Statistics, employment of pharmacy technicians is expected to increase 9 percent between the years 2014 and 2024. In the 2016 Occupational Outlook Handbook, the median pay was $14.86 per hour or $30,920 per year. The pharmacy technician program at Atlantic Technical College prepares students for employment under the supervision of the registered pharmacist. Graduates will receive an Applied Technology Diploma and will be eligible to sit a national certification to become a Certified Pharmacy Technician. The curriculum includes 1050 hours of classroom lectures and pharmacy externship. Course topics include clinical pharmaceutical procedures, communication and interpersonal skills, inventory maintenance, computer literacy, CPR, BLS Healthcare Provider, IV preparation, data processing, pharmacology, medication delivery, pharmacy law, record keeping skills, prescription processing, and HIPPA Legal and Ethical responsibilities. Students also learn infection control procedures, employability skills, IV preparation, math and science skills, pharmaceutical compounding, and purchase orders. Applicants must attend a Health Science program to obtain information about background check and drug screening. A high school diploma, photo ID, and social security number must be provided during registration. All health and immunization requirements must be met by the first week of class. The estimated cost of attendance is $3,440, including tuition, TABE assessment, registration, student activity fee, liability insurance, and accident health insurance. McFatter Technical High school’s pharmacy technician program teaches students how to assist pharmacists with filling and labeling medications, manage purchases and inventory, maintain medical records and patient profiles and adhere to pharmacy laws. They also learn medication distribution systems, aseptic technique, sterile IVs, pharmacy kinetics, pharmacology, pharmaceutical calculations, infection control, and communication and interpersonal relationships. In addition to classroom lectures, students will attend a pharmacy externship in a community and hospital pharmacy. Graduates are eligible to take the PTCE to become licensed and registered in the state of Florida. Students enrolled in the pharmacy technician program at McFatter Technical College acquire the skills and knowledge to assist the pharmacist in an institutional or community pharmacy. They learn how to manage purchases and inventory, use computer-based programs, create and update patient profiles, and maintain accurate medical records. Instruction in aseptic techniques, sterile IVs, pharmacy law, pharmaceutical calculations, pharmacology, unit dosing medications, and pharmacy law will prepare students for employment in a variety of pharmacy settings. The entire program covers 1050 hours in 10 months. The hybrid program requires students to complete a portion of the theory hours online – class times vary. The program schedule is Monday through Friday from 8:00 am to 2:30 pm. Graduates are eligible to take the PTCE to become registered and licensed by the State Board of Pharmacy. The program is accredited by the American Society of Health System Pharmacists. Persons interested in enrolling in the program must take the TABE, meet with the program counselor to review scores, attend a medical technology orientation (by appointment), and complete the FAFSA application before registering the Pharmacy Technician course. Tuition for Florida residents is $3,303. The 12-week pharmacy technician program at Barry University prepares students to past the National Certification exam. The curriculum covers 72 hours of lectures. Students are prepared for a career as a pharmacy technician where they will assist pharmacists in community and institutional pharmacies. The classes follow a lectured-based format with quizzes, interactive exercises, and competency assessments. Course content includes controlled substances, prescription processes, pharmacy math, patient interaction, patient privacy, basic pharmacology, the dispensing process, basic anatomy and physiology, unit dose and drug repackaging, state law review and discussion, and frequently prescribed medications. Graduates are eligible to take the National Healthcare Association (NHA) or the Pharmacy Technician Certification Board (PTCB) for national certification. They are prepared to improve their earning potential, have opportunities for career advancement, and meet their short-term goals of a career in the healthcare industry. Tuition for the program is $1,450 and includes the cost of textbooks.